Cechenena subangustata Rothschild, 1920, Ann. Mag. nat. Hist. (9) 5: 482. 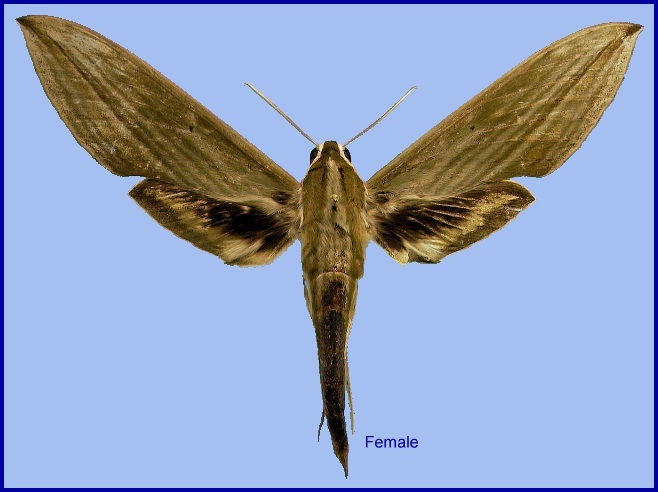 Type locality: [Indonesia,] Sumatra [Sumatera], Benkoelen District [Bengkulu], Lebong Tandai. Synonym. Cechenena subangustata Rothschild, 1920. Synonym. Cechetra subangustata continentalis Ivshin & Krutov, 2018. 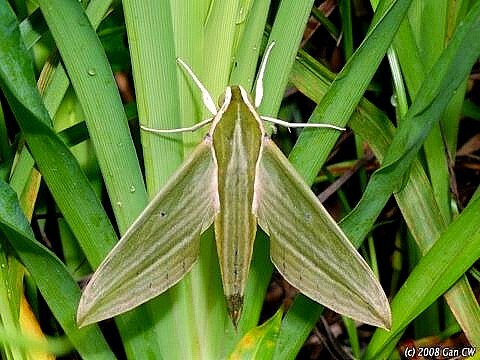 Note: Ivshin & Krutov (2018) state that Cechetra subangustata continentalis is as large as the nominotypical subspecies, but has a more uniformly green forewing upperside ground colour and, consequently, a less contrasting pattern of stripes. [Unfortunately, the green forewing colour fades rapidly with age and, consequently, leads to a reduction in contrast in the forewing patterns over time.] Analysis of mtDNA did not reveal any significant difference between the new and the nominotypical subspecies. The male genitalia differ from those of the nominotypical subspecies in the distal hook-like process of the phallus armature having 1 to 3 small teeth apically and/or on its upperside, and a slightly less angular harpe. These differences are too small and/or ephemeral to warrent subspecific status. 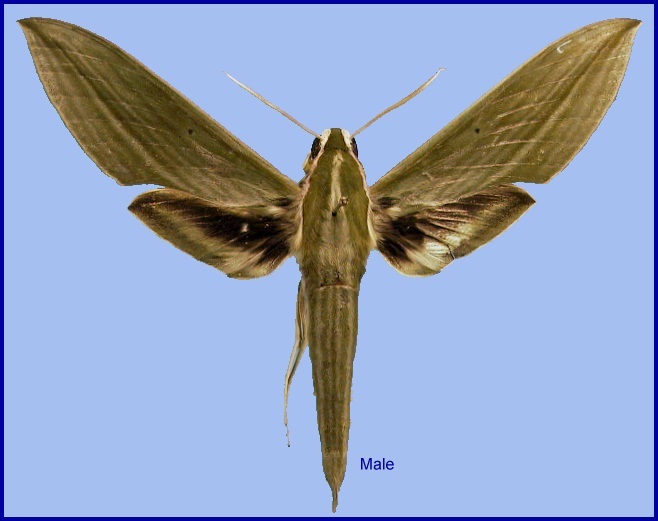 This species has been confused with Cechetra lineosa (Walker, 1856), but, according to Inoue (1990), can be separated by the following: larger; in fresh specimens forewing green all over (in Cechetra lineosa the green area is confined to costal and subterminal areas); hindwing underside blackish basal area broader and wider; both wings more yellowish (less orange-beige) below. In the male genitalia, harpe much thicker than in Cechetra lineosa, with serrate apical flap of aedeagus transversely wide and narrow. In the female genitalia, sigum slenderer and longer than in Cechetra lineosa. Individuals from Indonesia (Borneo, Sumatra) and Peninsular Malaysia are, on average, larger than Taiwanese ones. China: 12-13.vi (Yunnan). Taiwan: iv (Ilan Hsien); v (Nantou Hsien); vii (Taichung Hsien); viii (Chiai Hsien; Taichung Hsien; Kaohsiung Hsien); ix-xi (Nantou Hsien). China: Yunnan (Xima, nr. Yingjiang, 2080m; Gaoligong Shan). Taiwan: Taipei Hsien (Fushan); Taichung Hsien (Kukuan; Lishan); Chiai Hsien (Alishan); Hualien Hsien (Chian, 1950m); Ilan Hsien (Qilan, 700m); Nantou Hsien (Meifeng, 2100m; Wushe); Kaohsiung Hsien (Tengzhi, 1550m). In Taiwan this species is much rarer than Cechetra lineosa (Inoue, 1990). Nepal, northeast India, Thailand, southwestern China, Taiwan, Vietnam, Malaysia (Peninsular, Sarawak), Indonesia (Sumatra, Java, Kalimantan).